It is a basic hinge for high performance glass. It is a side hinge without bevel, manufactured for glass 8/12mm thick. It’s got a 90-degree turn. It is similar in characteristics to the B2000 hinge and the B1000 hinge, with the difference from the B1000 hinge being without a bevel. In addition, it has been available in black finishes for the past two weeks. 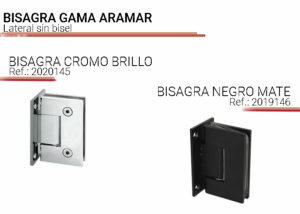 Specifically, it is available in matt black and glossy black with the references 2019145 and 2019146 respectively. The maximum weight supported by two units of these hinges is 40kg, which is more than enough for their most recurrent uses. However, the AISI316 finishes can support up to 60kg. Finally, we invite you to consult our catalogue to know the rest of our products.